We offer a free, personalized consultation to help you renew your kitchen or bath into a more beautiful, functional space to increase the value of your home and to more fully enjoy gatherings with family and friends. Many companies purchase or use vendor supplied images to show "their work". The Kitchen World gallery showcases actual Kitchen World projects. 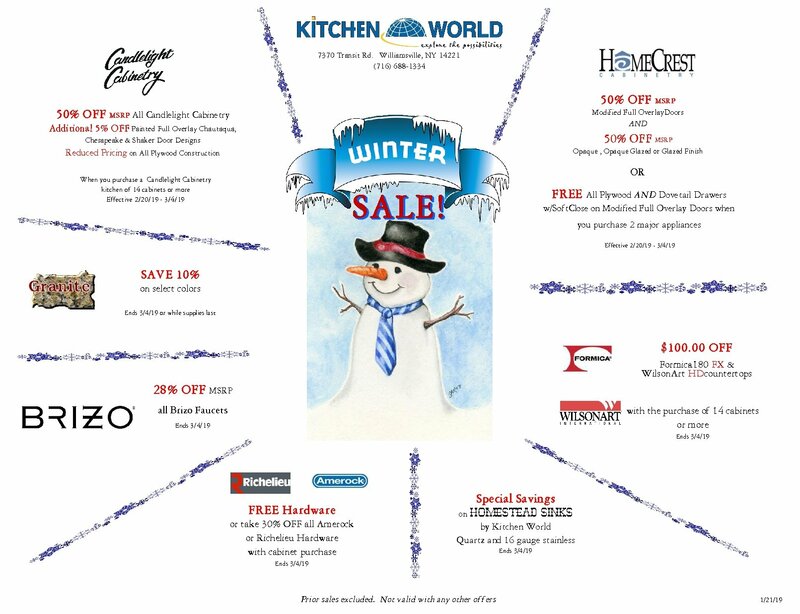 Since 1974, Kitchen World has been helping WNY families, builders, remodelers, do-it-yourselfers and developers make great decisions and improve the value of their homes. Visit us at our showroom in Williamsville, right across from the Eastern Hills Mall. Save with great deals on appliances and other kitchen products. At Kitchen World, we don’t sell, we educate. All of our home-remodeling products have been hand selected by the owner after careful research and attention to detail. Because our everyday low pricing is already the best in the business; we seldom have a “sale”. When we do have one, it isn’t phony and the savings are real! If you would like to time your order in line with our next offer, please click below. Copyright © 2017-2019 Kitchen World.